Hamburg: He might be very popular among the ladies, but Canadian Prime Minister Justin Trudeau had his ‘single man at the bar’ moment at the G20 summit in Hamburg last week. In a video shot by CTV news correspondent Glen McGregor, Trudeau was seen walking across the meeting room alone, seemingly looking for someone to mingle with. While everyone else in the room seemed busy striking poses for the photographer or having a chat, Trudeau awkwardly skimmed the room, silently navigating through the crowd of people and tables trying to make eye contact with anyone who was not occupied. With no one to talk to, he seemed to engage himself by fishing out a notepad from his bag, but not before looking up once more to see if he could strike up a conversation with someone. As seen in the video, the glance seemed to be directed at United States President Donald Trump, who was also engrossed in a conversation with two other delegates. 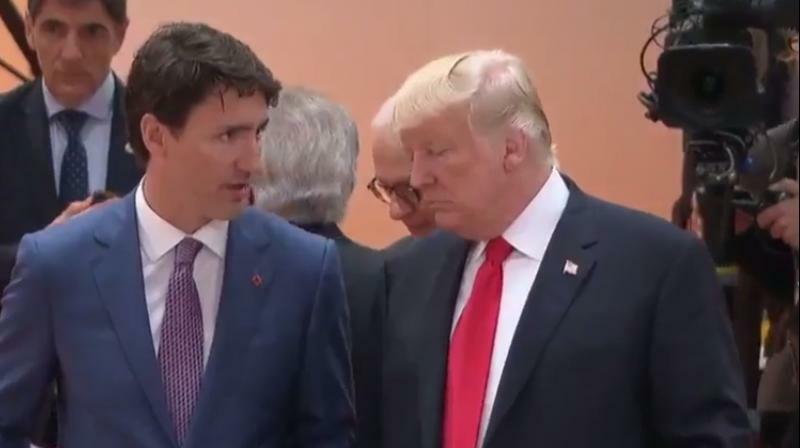 After being straight-faced for more than 30 seconds into the video, Trudeau finally managed a smile when Trump noticed him and beckoned him to join the conversation. He then proceeded to have a short chat with the US President, after which he fell back into an uncomfortable silence and resumed looking around the room before taking his seat.